This is another of those short posts. But, I can’t help it because it made my evening. As I was barbecuing outdoors, I saw a Robin fly from the tree adjacent to where I was standing. I was so surprised to see her nest that I immediately grabbed my camera and here it is. Robins lay one egg per day and after 4, then they stop. Mother robins may start incubating their eggs during the evening after the second egg is laid or after all are laid. The female does all the incubating. 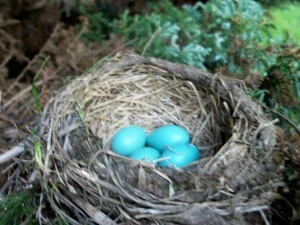 The name “Robin egg blue” has been trademarked by Tiffany & Co. Isn’t that interesting? With that in mind I have to tell you that today, Friday, it is one of those days that make you want to smile all day long. Why? Beacause it is gorgeous!! This is not a long post by any means. 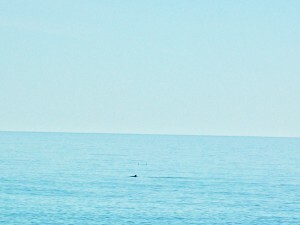 I just got so excited when I went to the beach in downtown Rehoboth and the water was so calm and the dolphins were jumping. I was trying to capture them with the camera but they were too fast. You will see a glimpse of them in a couple of pictures. 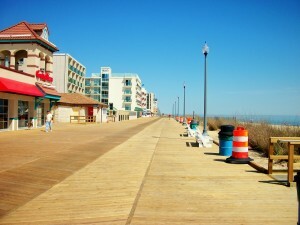 The boardwalk, newly finished also looks fantastic. 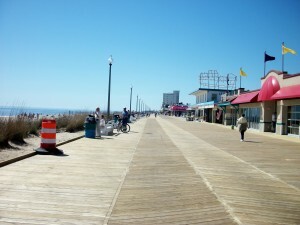 This Boardwalk is perfect for walking, biking or just for breathing in that wonderful ocean air. I just love it. Have a great day! !…That’s it!!! 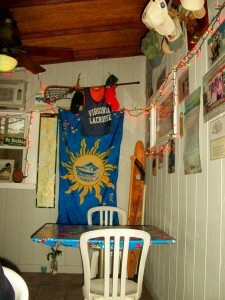 There is a second edition of Dewey Beach History & Tales and it provided me with some information for this post. This book is available at Browseabout Books located on Rehoboth Avenue in Rehoboth Beach. 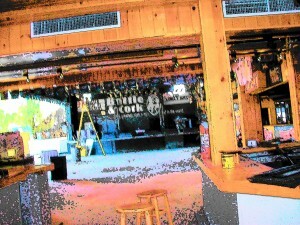 I took a drive through Dewey Beach, and you could tell that they are getting ready for this week-end. Every week more establishments are opening up. Well, Memorial Week-End is around the corner and that is, actually, the official opening of the season. Oh, how things have changed since those early days at the Bottle & Cork in the 40’s. By today’s standards it really was a bargain. There was a tab for a birthday party which included 20 beers, 3 shots, 1/2 pint Black label, and one cigar. The total was $3.65. The tab would then be settled 16 days later after an additional purchase of two more pints. 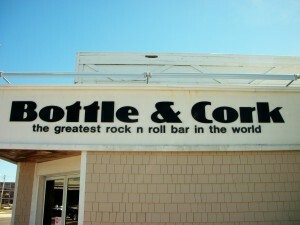 The Bottle & Cork’s appearance has change since those early days, but what has not changed is the aura around it. 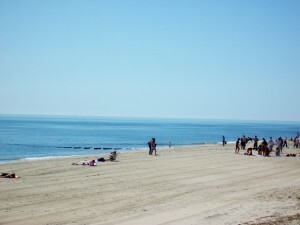 Vacationers in Dewey will make those lines to get in. 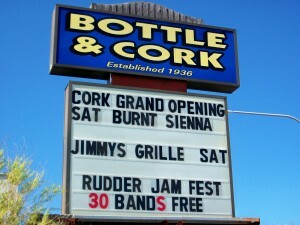 The Bottle & Cork is opening up on Saturday, May 1st. Full of history, being that it was established in 1936. The stories it could tell, if it could talk. Getting ready for opening day!! It was one of the major contributors to the growth of Dewey in the 1940’s and 1950’s. 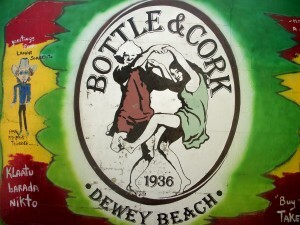 Apparently, no directions to any place in Dewey were complete without mentioning the Bottle & Cork, such as “go 2 blocks past the Cork, and turn right”, or “If you arrive at the Bottle & Cork, you have gone too far”. In the late 70’s Dewey was a drinking town with no apparent police force or lifeguards to control the situation. The town has come a long way. It is still considered a party town. 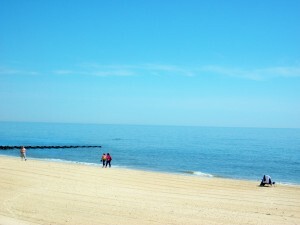 It is young and energetic, and definitely, a true beach town. So, Saturday, May 1st at 9 p.m. is the official opening. In case you do not know, the Cork is located at 1807 Rt. 1 in Dewey. You cannot miss it. Tel. 302-227-7272. You can follow them on twitter and Facebook. The entertainment for opening night is Burnt Sienna and they play a wide range of genres and eras. They started in 1997 and their concerts are very high energy. 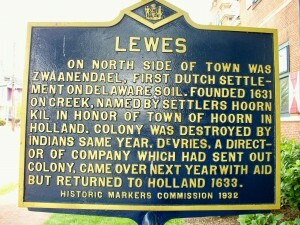 As usual, Lewes, is on-going with all its activities. 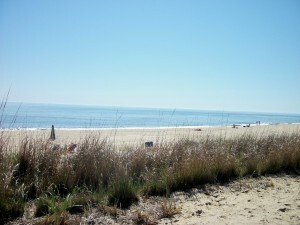 There is no way anyone could say that this is a little sleepy town by the Delaware Beaches. Friday, 4/30 – Sunday, 5/2 – Is the Lewes Merchants’ Spring Sidewalk Sale from 10 a.m. until 5 p.m., throughout the Lewes Commercial District. 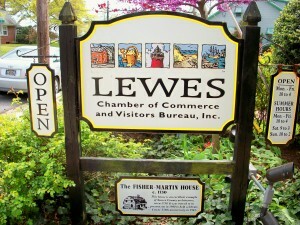 It is sponsored by the Lewes Chamber of Commerce, www.leweschamber.com. Friday, 4/30 – Queen’s Day – Celebrate the Monarchy of The Nederlands at the Zwaanendael Museum, from 10 a.m. until 4:30 p.m. It is free and open to the public. 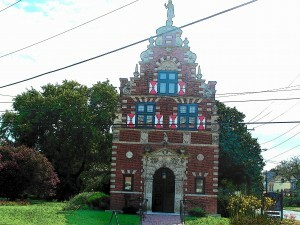 The Zwaanendael Museum was modeled after the town hall in Hoorn, the Netherdlands, and it commemorates the founding of Delaware’s first European settlement by the Dutch in 1631. Koninginnedag is a Dutch National Holiday and honors that nation’s 200 year old monarchy on 4/30. Activities at the Museum will include a video about the Dutch monarchy, a display of Delftware which is a form of blue and white pottery, children’s programs, and a display of Dutch royalty memorabilia. Visitors are encouraged to wear orange in honor of the House of Orange which is the Dutch Royal Dynasty. Need more info? Please visit www.history-delaware.gov. Saturday, 5/1 – British Car Show from 11 a.m. until 3 p.m. at the Lewes Historical Society located at 110 Shipcarpenter St., Tel. 302-645-7670 and website, www.historiclewes.org. Sunday, May 2 – Blessing of the Fleet from 2 p.m. until 3 p.m. at Fisherman’s Wharf on the Canal by the Drawbridge. This is a passionate event that allows everyone to bless watermen and honor those who have died in the past year. For more information please visit www.fishlewes.com. I don’t know why I was laughing this morning at 6:48 a.m. You know that laugh; it starts with a smile and then explodes. This info. struck me as very funny. 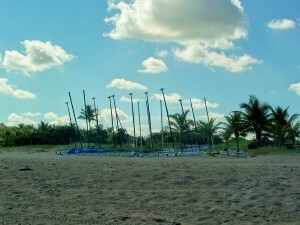 I started realizing that I had not written about Delray Beach in quite some time. I love that town, but I just have not been there. As I started to look around to see what was going in Delray the Chihuahua Races just popped. It is a Cinco de Mayo Festival but in this case it is going to be celebrated on Saturday, May 1st from 11:00 a.m. until 10:00 p.m. at the Old School Square Entertainment Pavillion located on 51 N. Swinton, right in town. There will be food, music, kid’s activities and dancing. Presented by the Hispano-Latino Cultural Alliance. Admission will be $10/person. For more info., please call 302-276-3396. The Chihuahua Races are going to be part of the festivities. 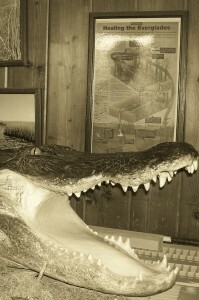 It is also sponsored by the Animal Rescue Force of South Florida, Inc. Tel. 561-784-8788. E-mail is info@animalrescueforce.org. Pre-registration – This needs to be done by 5 p.m. on April 29th. Otherwise, you can pay at the gate. Space is limited to the first 75 Chihuahuas that are entered into the race. There will be one free admission into the event with each $15 registration fee. All other persons in your party must pay the $10 Cinco de Mayo entry fee. All vaccinations must be current. All purebred Chihuahuas are eligible to race. This is just too funny!! In order to avoid discrimination against rescued Chihuahuas, no documentation will be required. Gosh, I am still laughing. If your dog looks like a Chihuahua and acts like a Chihuahua—-hey, it can definitely race!!. No kidding!! However, they want the race to be fair. If your Chihuahua is mixed with another breed that could give it an advantage, he/she will not be allowed to participate. The judges will determine eligibility should any question arise. This next one is important. This event is meant only for entertainment and a chance to show off your dog. Placing bets on dogs or gambling in any form is expressly prohibited. The length of the race course is going to be 35 feet. It will begin promptly at 4:00 p.m. The 5 lane covered track is laid out over a grass area. There will be an elimination race with 5 Chihuahuas racing at one time. Two minute delay between races. There will be no pushing your Chihuahua in order for it to run and no reaching out for it at the finish line, either. A treat at the finish line works wonders. The judges will have a final say whether a Chihuahua is disqualified from a race. There are other activities going on, as usual in this Village by the Sea. But, I am giving this one the Center Stage. The second season in Delray Beach is kicking in. It is a great time of the year. That beach is amazing. Palm trees and unobstroctive views. 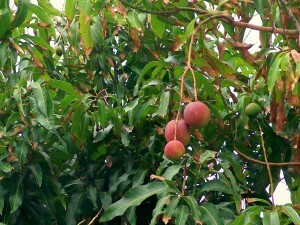 I wonder how the restaurants are doing, if the mango trees have fruit and the sea grapes are starting to get fruit, as well. Oh, well…..have a great day!! Part of writing my blog is my addition of recipes that could be begged, borrowed or stolen. I have always said that you should make the recipe your own; either adding or substracting ingredients, sometimes because you have to adjust to dietary regimens. I bought 2 cookbooks by the same author. Her name is Katie Moose. I met her at the Hunt Cup in Baltimore, Maryland a couple of years ago. And, the books are Chesapeake’s Bounty and Chesapeake’s Bounty II. These books are available at Amazon. 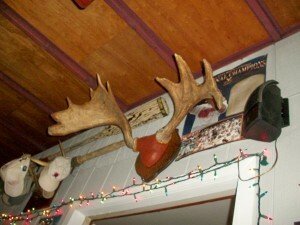 You may also e-mail Katie at kamoose@erols.com. 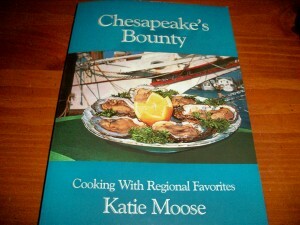 The cookbooks are full of information on Historical Facts on the Chesapeake Bay Region, its Historic Inns and Taverns, and the region’s wineries. They are also not the only books Katie has written. Others are: Annapolis: The Guidebook, Eastern Shore of Maryland: The Guidebook, New England’s Bounty, Nantucket’s Bounty, and Maryland’s Western Shore: The Guidebook. She has also co-authored The Best of Newport. Every time the weather gets a little cooler or rainy I always think that’s a call for a chowder. These soups stick to your ribs and they seem to cuddle you. Perfect for tonight’s dinner. 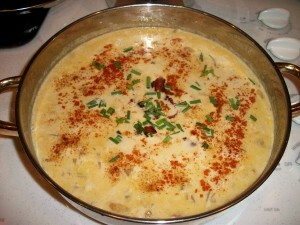 The Corn Chowder in the Chesapeake Bounty’s book turned out pretty good. Fry the bacon in a large skillet and reserve 1 tablespoon of the bacon fat. Saute onion and potato with the bacon. Stir in the corn. Add boiling water, sugar, salt and pepper. Simmer for 30 minutes. Adding 1/4 cup chopped red pepper adds color to the soup, but I did not do that. Adding 1/2 teaspoon cayenne makes for a spicier chowder. I definitely, did that. How did I make this chowder my own? I sprinkled paprika and I also added gruyere cheese as garnish, as well. These chowders usually are more caloric, so I just had a bowl for dinner. Of course, if you have dietary restrictions, please do adjust the recipe. This recipe is also gluten free. I have leftovers, so that is another plus. It does serves about 6 people. Talk to you later….you know I will…. I should not even have to mention the word Breast Cancer. All of us have been touched in one way or another with this devastating disease. I have plenty of friends in the past years diagnosed and courageously fought breast cancer. This event is getting more popular every year. I had never attended any of them. But, last year I did. To tell you the truth, it was emotional to see all of the people there congregating for one purpose only. To, help raise funds to benefit all of those who help fight the battle against breast cancer every single day. It was fun also. Some runners and walkers were celebrating remissions, others doing their thing in memory of loved ones. Family, friends, pets, kids in strollers, they came out so I hope you do too on Saturday, May 8th. 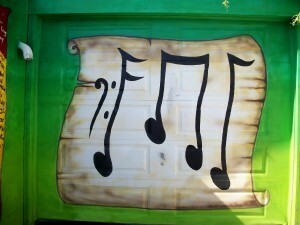 Meet at the Bethany Beach Band Stand at the Beach, at 9:00 a.m., rain or shine!!! You may sign up to donate, volunteer, or register on-line at: www.bethanybeachbreastcancer.com. The website is great. In it you will see what the Run/Walk is all about, pictures, where are the donations going, etc. etc. Pre-registration close on May 1st. DJ Sound Entertainment. JT Cruise has volunteered to provide tunes throughout the entire event!! More Questions? Please call Ann at 302-539-7500 or e-mail her to annrask@aol.com. What makes a good restaurant? To me, it has always been 5 key ingredients; I have mentioned them before. Some restaurants only have a few of those ingredients; The Grove Market encompasses them all, and they are: quality of ingredients, culinary competence, service, ambiance, and price. The ingredients should be the best money can buy, the culinary competence, well, what can I say? The Grove Market has John McDonald, a seasoned chef and one of the best. Many years ago he had in Rehoboth Beach the very popular Garden Gourmet. The service should be attentive; not intrusive, always anticipating what the customer needs. The ambiance should be tranquil and relaxing. At the Grove Market it was definitely tranquil, amidst trees and marshes. The prices are just like all the restaurants at the beaches who are known for serving quality food. 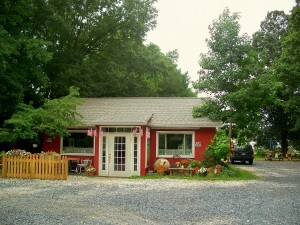 The Grove Market is located on 12402 Saint Martins Neck Rd., Bishopville, Maryland, 21813. Tel. 410-352-5055. Even though it is in Bishopville, it is actually just so close to Ocean City, Maryland and I came from Rehoboth Beach, Delaware which took about 40 minutes. 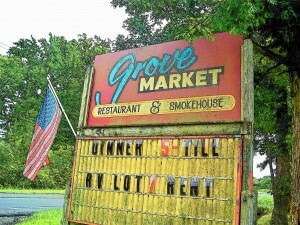 It is tricky getting a reservation at The Grove Market. The restaurant is small. 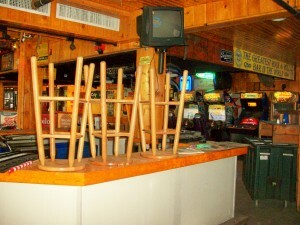 I think about 7 tables and 2 can eat at the bar. Therefore, reservations go quickly. My tip would be that if you want to eat there, then make the call, leave your information, and request any time they have available. We went at 5:30 p.m. which is earlier than I would have gone to any restaurant but it was fine, and it was definitely worth it. Leslie and Patrick greeted us very graciously and took us to one of the tables in the back. Every time I go into this restaurant I just love looking around. 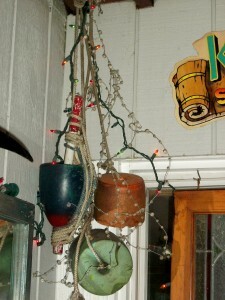 It is funky; the walls are decorated with all kinds of adornments; lacrosse sticks, pictures, holiday lights, you name it. 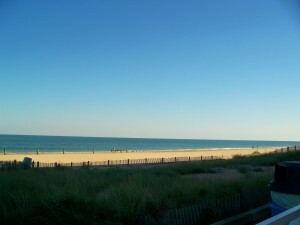 Let me point out to you that there is not other restaurant like it in the Maryland and Delaware Beaches. 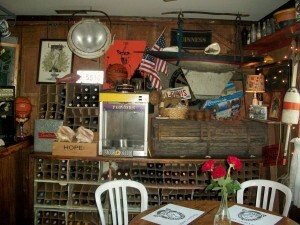 They have an extensive wine list. 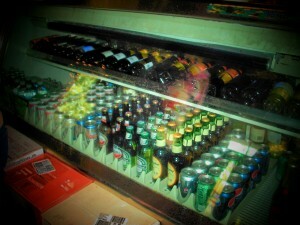 Beer is available as well and soft drinks. There is no menu. Everything is recited from memory. 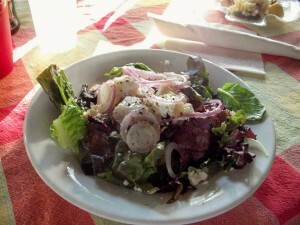 I chose for my salad a beet salad with arugula and goat cheese. I have had it before and it was again, delicious. 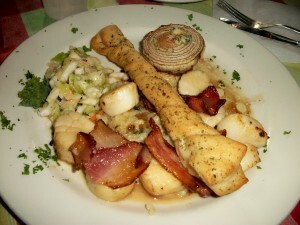 I knew that if they had the scallops I would order them as well. Last time they were so good, accompanied with a risotto and a roasted vidalia onion; they did not disappoint me. Just as good. 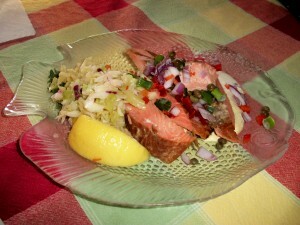 Another appetizer was the smoked steelhead salmon. Here is where the explanation comes. The steelhead salmon is commonly known as trout. They are a species of salmon. The land locked steelheads are known as rainbow trout. The term steelhead differentiate between those rainbows that stay in fresh water permanently and those that go out in the ocean. In order to spawn, they return to the place where they hatched. Can be caught year-round and fly casting remains the most popular way to catch them. If you like salmon, you would really enjoy this appetizer. Just like salmon, the taste is a little bit stronger. Another entree ordered was the duck. 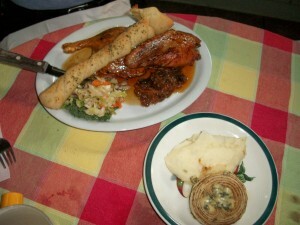 It was roasted, a semi-sweet soy drizzle, with an English cumberland sauce, mashed potatoes and vidalia onions. The Cumberland Sauce is a fruit base sauce with ingredients like red currants, port, mustard, pepper, orange, ginger and vinegar. One person ordered dessert and I took a bite of this dense chocolate silk pie. 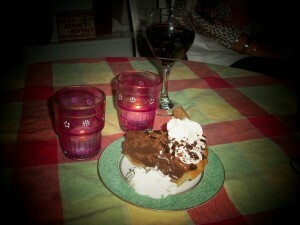 It was very good and sinfully rich. As usual, I have to say that a meal is best enjoyed with good company. As we were leaving, people were waiting. 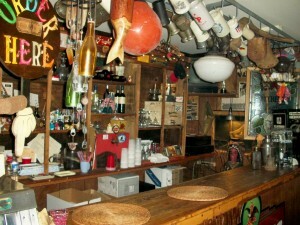 This restaurant is and has been very popular for a long time. Another thing worth mentioning is that the restaurant was very sensitive to two people on our table with food related allergies; seafood, peanuts and gluten. I guess I will be talking to you soon…. Please note that The Grove Market does not take credit cards. Information for this post was taken from http://gosalmonfishing.com.